International Advanced Research Centre For Powder Metallurgy And New Materials (ARCI) Hyderabad is looking to engage following staff purely on Contract Basis to work for the sponsored project. All these positions are temporary in nature and are co-terminus with the duration of the time-bound sponsored project (i.e. 31st March, 2021). 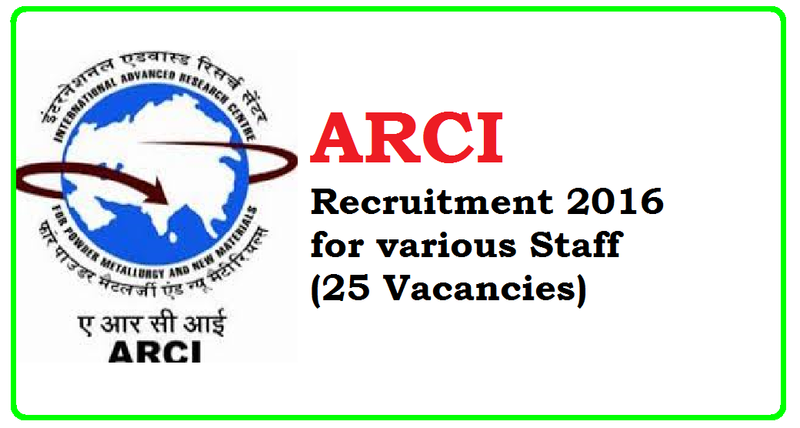 Positions are available at different levels and the project will be operated by ARCI at National Capital Region (NCR), New Delhi. The last date for receipt of applications is 18th July 2016. ARCI has been awarded a time-bound sponsored project by Government of India to set-up and operate “A Programme Implementing Unit (PMU)" for implementation of a nationally coordinated project on scouting and nurturing of young talents in the area of science, engineering and medicine etc. The project duration is for a period of 5 years with effect from April 2016. About: ARCI - An Autonomous R&D Contra of Department of Science and Technology, Government of India. The Last Date for receipt of filled-in applications is 18/07/2016.